The most sustainable and lightest timber table in the world, designed by Benjamin Hubert is a part of an internal studio research project into lightweight constructions, the table, titled Ripple, is 2.5 metres long, one metre wide, and weighs only 9 kilograms. Ripple is made using 70-80% less material than a standard timber table, and can be assembled and manoeuvred by a single person. The table’s impressive strength to weight ratio is enabled by an innovative production process of corrugating plywood (shaping into alternate ridges and grooves) for furniture through pressure lamination, which was developed by Benjamin Hubert with Canadian manufacturer Corelam. The table is made entirely from three ply 0.8mm birch aircraft plywood, a timber sourced only in Canada, where the table is manufactured. The material is the same as that used in construction of the Hughes H-4 Hercules – popularly known as the “Spruce Goose” – the world’s largest all timber airplane. The strength of the material in combination with the unique lamination process means the edge of the Ripple table measures just 3.5mm. “Ripple is minimal in its design language, employing a simple knockdown construction.” says Hubert. 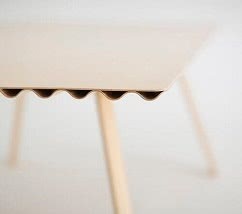 The top surface of the table is corrugated plywood overlaid by a flat sheet, and the A-frame legs are a sandwich construction of two corrugated plywood layers.